There is no disputing the fact that e-commerce has successfully emerged out as one of the most popular and powerful mediums of modern age trading and merchandising. Gone are those days when influential enterprises particularly, wholesalers and distributors considered e-commerce and digital marketing as an afterthought. Today, B2B corporations and enterprises have also realized the benefits and importance of internet marketing and are taking strong initiatives to establish a firm online presence just like their B2C counterparts. The E-commerce retailers used to ask; why should you follow SEO best practices to increase sales & conversations in your e-commerce? Including this, there are many questions about generating more traffic, increasing conversions, improving sales, engaging customers and turning them into followers. But as an e-commerce retailer, you must know that, for an online store that relies on search queries & organic traffic to make businesses, more than 40 percent of online retail stores depends on the search engine. SEO is the highly important factor to grow and develop your business online. However, be it B2B or B2C, the competition in e-commerce is harder than ever. Every day, hundreds and thousands of new and progressive e-commerce website are madly flowing into the internet leaving no room for laxity for marketers. For an e-commerce store to survive, it must strengthen itself from the rest and should standout, as there is no other option than to keep up. This is where SEO comes into action. It makes it easy for prospective customers and internet users to find you among the clones as your products get more visibility and exposure. Without an effective and intensive SEO plan, your store will get lost as the race for customer acquisition is getting more and more intense. The fact is that if your website fails to acquire a respectable position on search engines, it will face a lot of problems not only in securing new leads but also in retaining present customers. Why Product Page SEO is Important? Primarily there are two types of pages on an e-commerce website. Firstly there are overview or content pages where you build the navigation structure and add layers to your website. And then there are the product pages where you provide the information about the product and this is the place where the visitors turn into customers. The problem with many SEO experts is that they put a lot of effort on content pages and often undermine the importance of product pages; for them, it’s like a strange thing to worry about. This is an entirely wrong approach. I consider product page SEO more critical as it helps in generating more and more revenue. I am entirely not saying to ignore content page SEO; but my point is that content page SEO only adds juice to your overall marketing efforts, whereas product page SEO helps conversions. However, as a beginner in the industry, you might find yourself at the crossroads principally deciding what areas to prioritize for an effective product page SEO. This is where we step in; in this article, we are going to highlight 5 proven tips to enhance your product page SEO and improve conversions. In the world where 93% of the online experiences begin a search engine query; 70% of those queries comprise of long tail keywords. This is a huge opportunity for marketers as long tail keywords are comparatively easy to rank and have less competition. Moreover, customers are likely to use a long and descriptive phrase when they are closer to the point of purchasing. The best way out to engineer long tail keywords is “to think like a customer.” Try to come up with phrases and possible words that you would use as a customer to find the particular product on the internet. In addition to that, choose the keywords that are highly relevant to your products and services. Don’t go for the keywords that are too broad. Thanks to Google’s free Adwords, you can find the potential keywords with a high exact match, and Moz's keyword tool is all there to indicate you the difficulty score. Content is still the king in 2018 and is not going to give its throne is anytime soon. A great way to add content to your product pages is by providing a complete and detailed product description to your customers. Make use of fancy words and phrases to bring your product into the limelight. Capitalize this opportunity and go beyond the default word count. A product description is an excellent tool for user engagement as well. Lengthy and creative product descriptions make user stay longer on your website and decreases the bounce rates. One important consideration worth mentioning is to avoid using the exact product description as provided by the manufacturers. Manufacturers usually send a generic product description to tons of other websites, so it creates duplicate content issues and search engines are going to penalize you for this. Most importantly, it doesn’t differentiate you from the rest. Like I mentioned earlier in the article, you have to accentuate yourself from the clones. So make it a mandatory practice to add unique and creative product description that engages your customers. This will not only differentiate you, but you will also have an increased chance of an appearance in the top 10 search results. Image optimization is one of the most neglected; yet clinical areas when it comes to driving more traffic and increasing conversion rates for any eCommerce site. Images, videos or gifs are also the part of the content and high-quality product images are a vital source of visibility and user engagement. And just like your textual content; your visual content also needs optimization. Wisely optimize all the Alt Tags as they increase the SEO value and help your product pages achieve a better ranking by associating the keywords with images. However, the users on the internet are very impatient, so make sure that the images do not take more than three seconds to load. It’s a fact that some product on your website gain more traffic and generate more leads compared to others. So it is important for marketers to carefully analyze the behavior of visitors on the website and tailor the SEO efforts accordingly. It is important for you to consider the demand of your products and put more efforts on the products with high demand. Moreover, also make sure that the customer lands on the product relevant to his query. If you make him/her land on the irrelevant page, he/she is going to abandon your website within seconds. The 'Product Reviews' is also an excellent tool for user engagement and is something every online buyer desperately looks for. As a matter of fact, as much as 72% of online shoppers consider the product reviews before making any purchase and 88% of online customers trust online product reviews as much as a personal recommendation. This is a clear indication that you might lose a good number of leads if there are no product reviews. It adds content to your product page which comes for free and is relevant and of user interest so helps in keeping the product page alive and is good for overall SEO efforts. User-generated product reviews allow customers to be the voice of your brand. Moreover, it removes communication barriers and doesn’t take negative reviews as a sale killer; they make overall reviews more reliable and trustworthy. Today customer demand more control over the process and user-generated product reviews make people more comfortable as they have the power to make or break a product. Moreover, it helps marketers to build a community around the product to defeat huge brands. To be fair, getting your product pages ranked is not an overnight job. It requires marketers to analyze and interpret search engine trends as well as customer preferences. 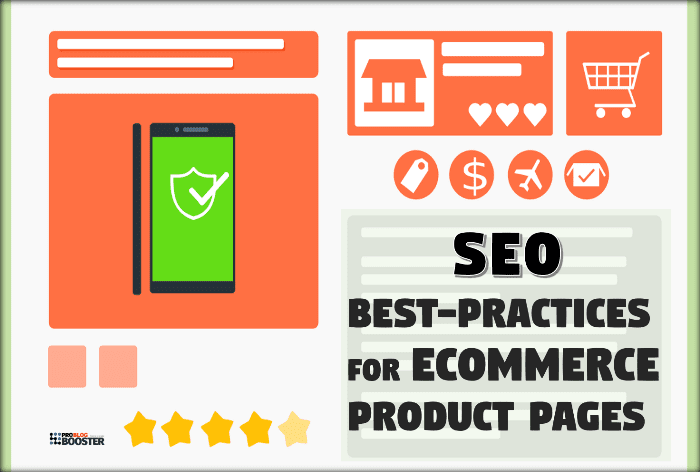 However, the above-mentioned simple tips are easy to implement techniques to supercharge your product page SEO efforts and take your sales to a whole new level. Article By Asad Ali - is a digital marketing expert having more than 7 years of experience. Currently, he is heading the marketing team at GO-Gulf Dubai - a custom website development company. His expertise includes eCommerce SEO, design optimization, boosting conversions and targeting relevant customers. You can reach him on LinkedIn.